A conference attended by thousands of Muslim clerics, scholars and community leaders in India has endorsed a religious ruling against terrorism. The ruling or fatwa was issued earlier this year by an Islamic seminary. It said that Islam rejected all kinds of bloodshed and the killing of innocents for selfish and politically motivated gains. This is the first time the Islamic scholars have come together to give their backing to the measure. The fatwa was issued in May this year by the religious school, Darul Uloom Deoband. Coming from one of the most respected Islamic theological schools in the region, the fatwa is significant, correspondents say. Abdul Hameed Nomani, one of the organisers of the conference, which was attended by more than 6,000 Islamic scholars, said: "Some people are involved in terrorist activities in the name of Islam and some are defaming Islam by involvement in terrorist activities. "We condemn both. The country is facing a challenge. We must fight it together without calling it as a Hindu-Muslim problem." Many Muslim leaders feel that the actions of a few misguided individuals were being linked to Islam, tarnishing the image of the community as a whole. Today, at more than 138 million, Muslims constitute more than 13% of India 's billion-strong population, and in sheer numbers are exceeded only by Indonesia's and Pakistan's Muslim communities. 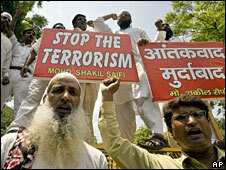 Several Indian cities have recently been targeted by serial bombings which were blamed on Islamic militant groups. The bombings also triggered tensions between Hindus and Muslims in some areas. The Indian Muslim leaders have now taken a series of initiatives to spell out clearly that the community is opposed to terrorism and it should not be unfairly viewed with suspicion. The meeting also drew the government's attention to a range of problems facing the community, including unemployment. A recent government report confirmed that a majority of India's Muslim population lagged behind members of other communities, according to various social and economic indicators. At just under 60%, the community's literacy rate is lower than the national average of 65%. Only half of Muslim women can read and write. As many as a quarter of Muslim children in the age group 6-14 have either never attended school or dropped out. They are also poor - 31% of Muslims are below the country's poverty line, just slightly above the lowest castes and tribes.